Subject: Will General Electric Stock Price (NYSE: GE) Get a Boost from Asset Sale? This is part of Fairfield, Conn.-based GE's plan to divest the bulk of GE Capital – which means shedding $200 billion in assets. Is the General Electric Stock Price Going Up? The short answer is yes, this sale will help the GE stock price. GE's unit sales, repatriated cash, share buybacks, and dividends are expected to return some $90 billion to shareholders through 2018. The deal should also boost the General Electric stock price since the market discounts financial earnings more aggressively than it does industrial earnings. That's due to the higher potential volatility of financials. Another thing that will help the General Electric stock price long term is more smart acquisitions. 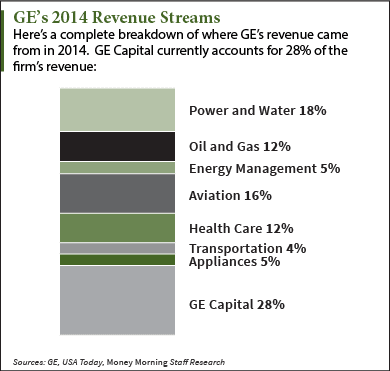 It's clear GE will spend a chunk of its new billions on deals. The company has been on a spending spree. GE is reportedly weighing a bid for a chunk of Halliburton Co.'s (NYSE: HAL) $5 billion to $10 billion assets up for sale. Parts of Halliburton have been put on the market because it needs the Federal Trade Commission's (FTC) nod to complete its $34.6 billion merger with Baker Hughes Inc. (NYSE: BHI). A GE bid is likely for some pieces. In April 2014, GE agreed to buy Lufkin Industries, which provides artificial lift technologies for the oil and gas industry, for $3.3 billion. In November 2014, GE spent $13.5 billion for the energy business of Alstrom, the French power and transportation company. In 2013, GE completed the purchase of the Avio's aviation business, an Italy-based manufacturer that provides components for GE Aviation and other engine companies, for $4.3 billion.